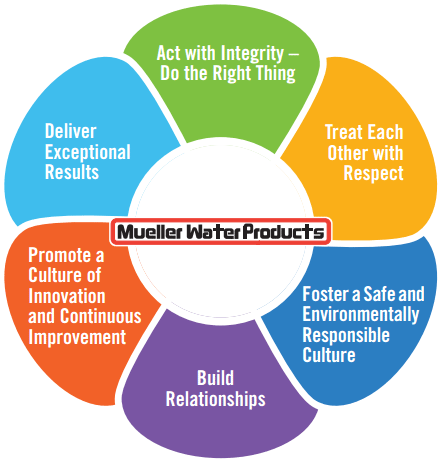 Mueller Water Products has a set of Core Values to help us think, act and work together to benefit all of our stakeholders – from our employees who are our most valued assets, to our customers who expect quality products and service, and to our investors who entrust their capital to us. We are honest, ethical and act with integrity with each other, our customers, stockholders and other business partners. We do what is right, not what is easy. We value, protect and enhance the reputation of our brands. We value our people. We are considerate, professional and open in our interactions with one another. We are an inclusive organization and recognize that each of us contributes to our success. Protecting the health and safety of our employees is essential. We implement effective and responsible work processes and procedures based on industry best practices. We strive to be good stewards of the environment in the way we conduct our business. We actively build relationships with our colleagues, customers and vendors. We know that more is accomplished by working as a team than alone. We establish common goals. We know each of us brings unique experiences and perspectives to the Company. We encourage innovation, creativity and being leading edge. We continuously look for ways to improve. Our success hinges on our ability to navigate and lead change. We remain flexible and embrace innovation. We anticipate and drive change. We expect the best of each other – and ourselves. We are accountable for accomplishing aggressive goals and objectives. We believe “good enough” isn’t. We know our customers, investors and employees have a choice of where to do business, invest their money and work. Our actions demonstrate why that choice is Mueller Water Products. To be a trusted partner to suppliers of water and energy infrastructure globally. Our solutions are recognized for their reliability, innovation and ability to deliver the lowest total cost of ownership. We help utilities increase operational efficiencies, improve service levels, prioritize capital spending, ensure access to water and energy, and protect lives and property. To be a trusted provider of branded products and services known for superior quality, reliability and the lowest total cost of ownership that help our customers operate their businesses more efficiently and protect lives and property. We manage our businesses to realize leadership sales and value creation over the long term.